Glass counters are described as cool, sleek or even referred to as a contemporary art piece. Putting these positive attributes aside, if you’re considering using a glass countertop you’ll want to get past the novelty of this unique product and get some straight answers to practical questions of how this type of counter will need to be designed and maintained for your kitchen, bathroom or rec room. The goal of this article is to provide you with the answers to 7 questions on the everyday use, design, pricing and installation of glass counters. 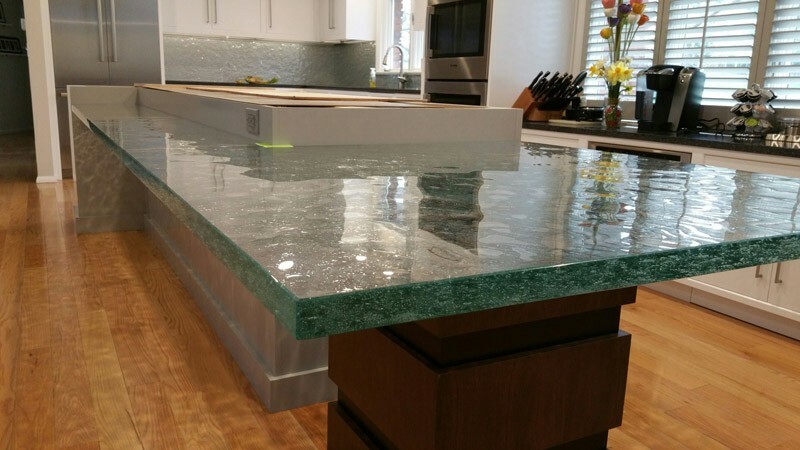 (a) Design with a texture or color – Using a cast glass countertop with a textured, obscure or colored back coated glass bottom surface makes it difficult to notice scratching on the top. (b) Don’t drag rough objects across the top – This is a common sense tip but stay away from sliding items like clay pottery with rough bottom surfaces across the glass counter. (c) Cut with a cutting board – It’s best to pull out a wood cutting board vs. cutting directly on the a glass counter. Question #2 – How do you eliminate seeing clutter through a glass counter? – While the cool feature of glass is it’s clarity and ability to reflect and transmit light through a surface – it is also an important design detail to determine how to not see through the top of the glass into the drawers below. The solution is to attach a substrate (stainless steel and aluminum are the 2 most common types) to the bottom surface of the glass. The bottom substrate will still allow light to flow through the glass and create dramatic reflections from the top surface – but it eliminates unwanted views through the glass. 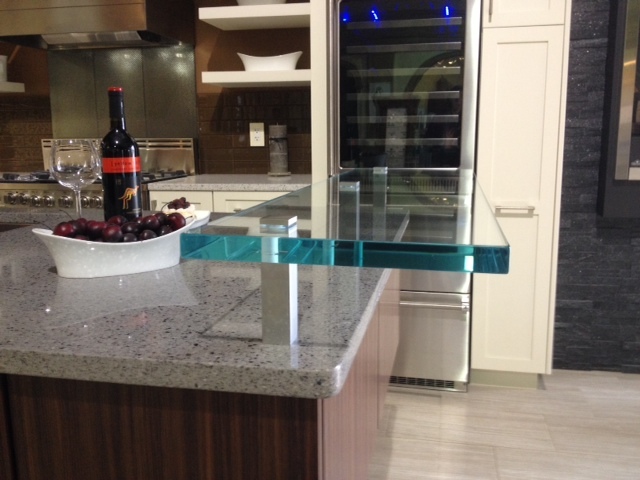 Question # 3 – How expensive are glass counters? Do they cost more than granite? 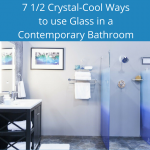 – If you want an inexpensive kitchen counter or bathroom vanity top a solid float glass or cast glass countertop are probably not the best choice. 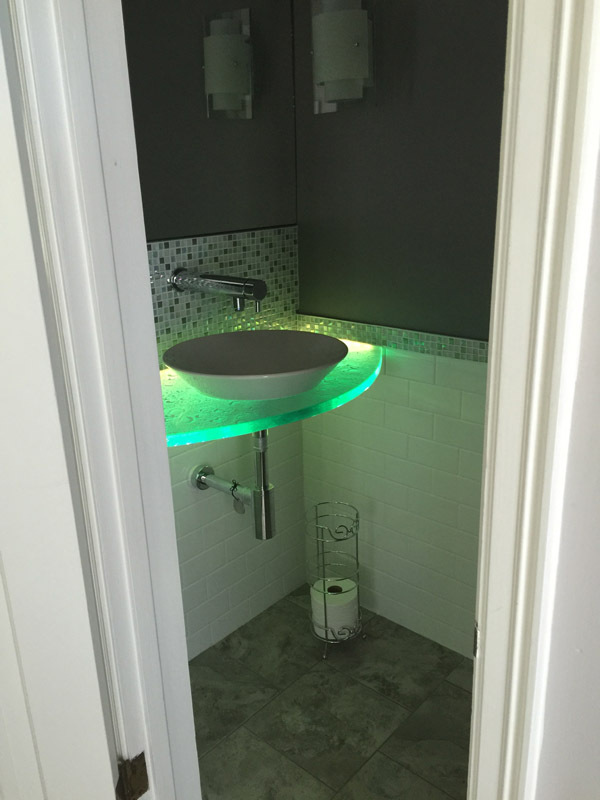 The price of these counters can range from $160 to $300 per square foot depending on material thickness, type of glass (standard glass with a greenish hue, ultra clear glass or whether you are using a flat or cast glass). 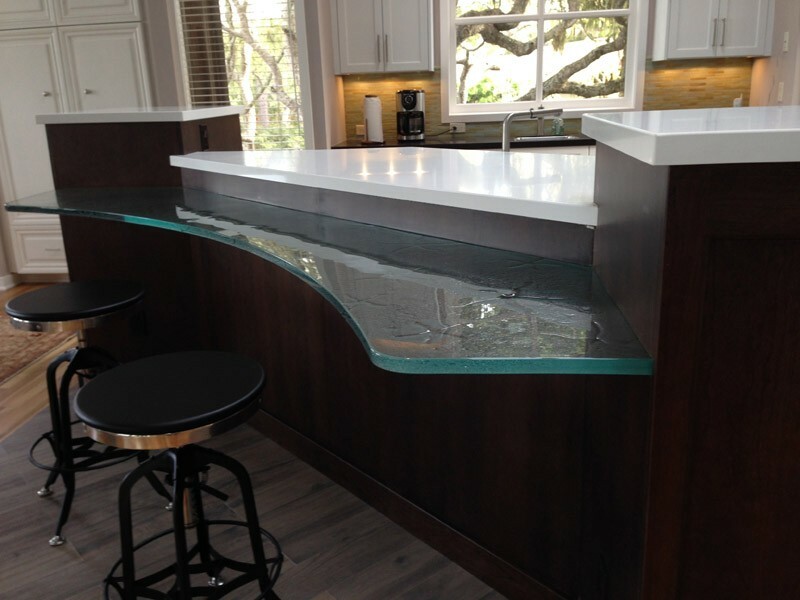 Glass counters are usually more expensive than granite but they can also be used in conjunction with one another (see the raised counter application below). Question # 4 – Who can install glass counters? – While a small project (like a bathroom vanity top or a raised glass counter) could be installed by a small contractor or DIY’er larger, more complex tops are usually installed by natural stone fabricators. Question # 5 – How do you clean a glass countertop? – What’s great about glass is it is a non-porous surface which is easy to clean. A damp cloth or sponge works best for cleaning. For more difficult spills you can use a non-abrasive surface cleaner. 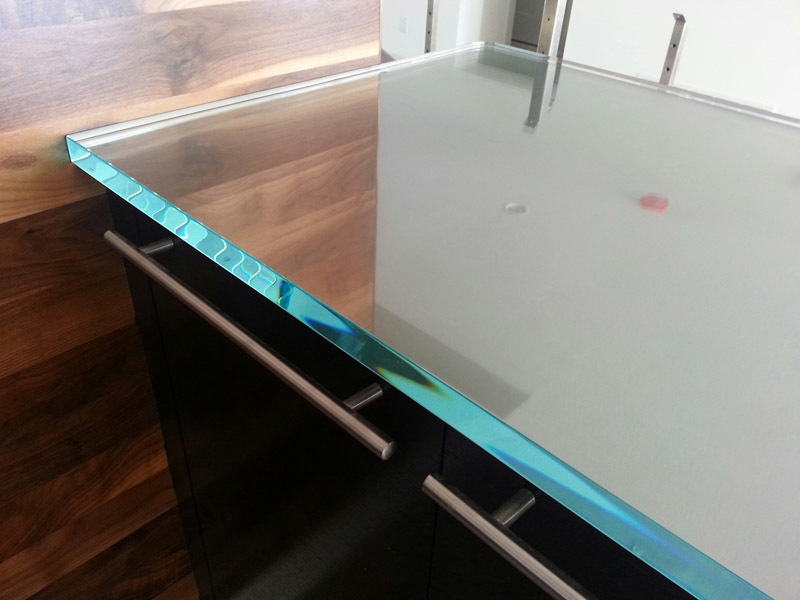 Question # 6 – What design options are available in glass countertops? – Glass counters can be made from different types of glass (including cast and float glass) with various textures and back painted colors on the bottom surface in multiple thicknesses (generally from ¾” to 2” thick). The best choice for your project will be determined from your design goals and budget. For a clean, contemporary look a clear smooth float glass is an excellent choice. 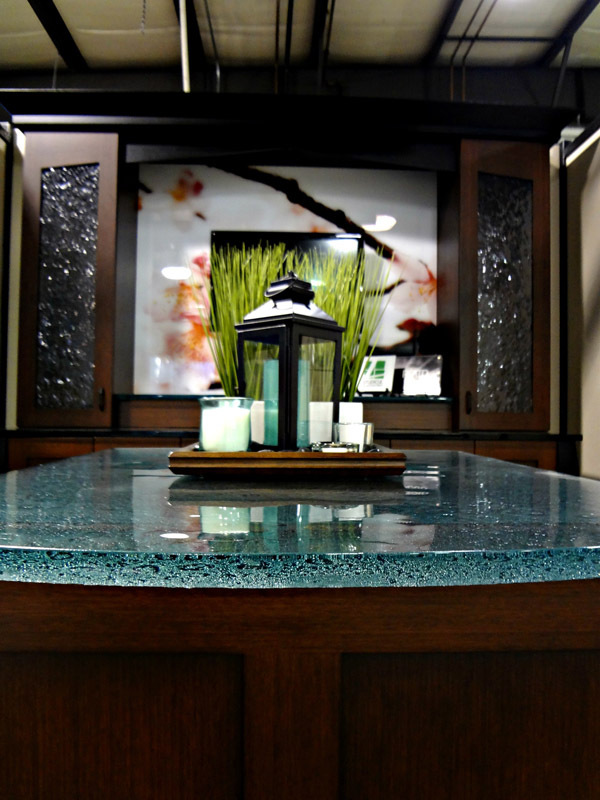 For a dramatic artistic flair a cast glass countertop with a textured bottom is fun. For a bolder appearance the thicker 2” tops make sense, but if you have a tight budget a ¾” thick top will be most cost effective. Question # 7 – How do you light a glass counter? – While drama is not a good thing if you’re talking to your 13 year old daughter (Yes – I have a beautiful 13 year old daughter who occasionally brings along some drama) it can be fantastic when you’re looking at a “contemporary illuminated art piece” – AKA a lighted glass countertop. One of the unique features of glass counters is the ability to add light which flows through the counter. This can be accomplished by incorporating LED lights through a side(s) of the top or positioning LED lights between the substrate and the glass (when there is not a bordering wall to place the lighting). Do you have any additional glass counter questions? Please comment or call us at the numbers below for additional insights or pricing. Call Innovate Building Solutions on a nationwide basis (877-668-5888) or for a local project their divisions in Columbus (614-252-3242) and Cleveland (216-531-1280) Ohio. I’m almost sold. 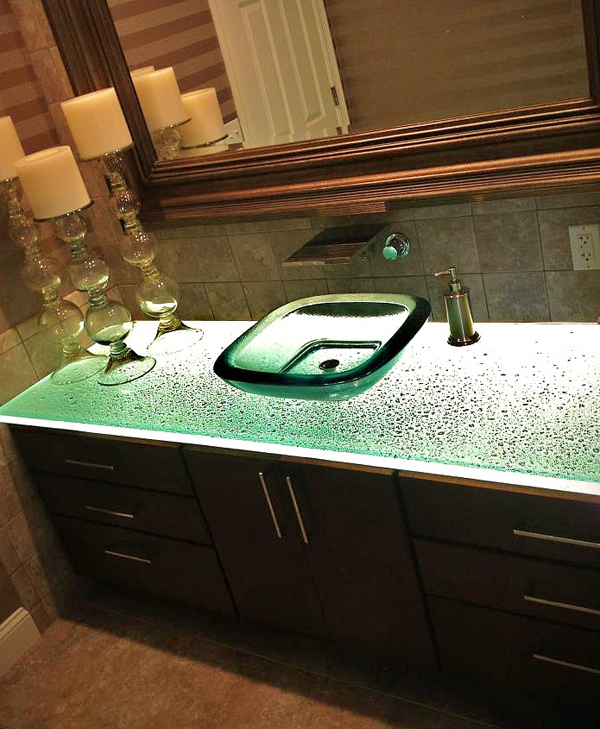 I love the idea of a beautiful lighted counter top. It would make eating an event rather than just a necessity. I’m wondering, however, about light replacement (ease of replacement, frequency and cost. I will want to use lighting daily, not just when company comes a calling. What say you?